Montee is a member of the Seminar for Undergraduate Mathematical Research (SUMR), a program designed for the most talented mathematics students at Notre Dame. Montee is completing a senior honors thesis, titled “On the Construction of the Chern Classes of Complex Vector Bundles.” Montee has already authored or co-authored three research articles, two of which have been submitted for publication and have appeared on the Mathematics ArXiv. Montee’s adviser is Frank Connolly, professor of mathematics and director of the SUMR program. 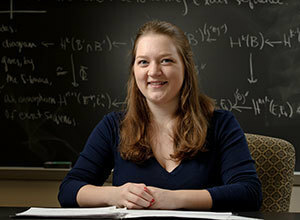 Montee will receive the 2013 Schafer Prize at the Joint Mathematics Meetings in San Diego in January. She is the daughter of Tim and Gretchen Montee of Sturgeon Bay, Wis. Originally published by Marissa Gebhard at newsinfo.nd.edu on November 09, 2012.